TechRadar Pro brings you the latest enterprise and business news, titbits and interviews from the world's biggest mobile-related event. 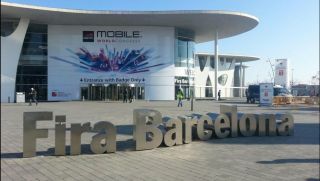 Mobile World Congress is taking place in Barcelona and kickstarts on Monday 24, spanning over four days. We are onsite from Saturday to cover the traditional MWC press day which happens the following day, just before MWC opens and will keep this page updated till Thursday evening. We will be covering the likes of Microsoft, Intel, Qualcomm, Huawei, HP, Samsung , Fujitsu, Panasonic, NEC and a lot more. You can also follow TechRadar's running MWC 2014 thread to find out more about the latest smartphones and tablets that will be launched over the next few days. The freshest content will be chronologically published below and times will be GMT. Don't forget to follow us on Twitter @techradarpro. Security specialist Webroot and expert Cellebrite have just taken the wrappings off a mobile malware protection solution for telcos and retailers. The service, which will be marketed as a product, will see Cellebrite placing Webroot's Mobile App Reputation Service and URL Classification Service under the bonnet of its diagnostics product range. MWC 2014 has now passed the half way point. Our first interview today was with Kevin McDonagh, CEO of Novoda, which is best know for its work with Tesco on its popular Hudl tablet. McDonagh reckons that the traditional RTOS (Real-Time Operating System) is ripe for disruption and is in a similar position to the smartphone market before Android landed. We've just met with Huawei's President IT Product Line, Yelai Zheng, who explained to us the concept of the company's Cloud OS, something that was launched last year. It consists of three virtualization components (computing, storage and network) plus a set of APIs. The idea is that IT and telecoms is on a convergence path because they use similar hardware and software, so moving the three components to the cloud could save them both "OpEx" and "CapEx". Huawei reckons that service providers are in a unique position to offer cloud services with minimal latency and a high QoS (quality of service), and therefore have a real chance of adding value to their business. One day after launching the Galaxy S5, Samsung gave us the low-down on its KNOX enterprise-oriented service. Essentially an app store for business users, the South-Korea based company revealed that it picked AppDirect to provide the service, and there are just under 150 apps available at present. The second version of KNOX has brought a bunch of new features, including certificate management, VPN+, an enhanced container, an enterprise mobility management as well as consolidated billing. According to Samsung, around 7,000 KNOX-enabled devices are activated daily. We just met with AMD and Nvidia to hear about their latest innovations. Nvidia didn't have a lot to talk about beyond the K1 launched at CES as well as a couple of Iocera-powered LTE solutions based on Tegra 4 and 4i. AMD was talking up its new mobile platform based on its Mullins APU with 2 or 4 Puma cores and we saw plenty of demos of it in action. The company also used MWC to announce a partnership with Bluestacks that will result in the availability of a new BlueStacks dual-OS based around Android and Windows that is optimised for AMD APUs. This means that you'll soon be able to buy a Windows-based device (with an AMD APU) that can run tons of Android apps (any from the Google Play store) as an executable file in Windows without the need for a reboot or dual-booting. We get hands on with Panasonic's new 5-inch Toughpad - coming soon on the site in hands on form. It's available in both Windows 8.1 and Android flavours and features a barcode reader, dual-SIM support and numerous other waterproof and dustproof tech.